Jillibean Soup: Chicken Noodle Collection and a giveaway! Let me start by issuing a disclaimer: I pretty much love all the Jillibean Soup products, so being asked to review the Chicken Noodle collection was like asking a pig to wallow in a nice, cool mud puddle. Count me in, baby! Why am I talking about pigs and mud puddles? Well, as you can see, the Chicken Noodle collection has a barnyard theme, and one of the featured creatures (say that ten times fast) is a way-too-cute piggy. Adorable! 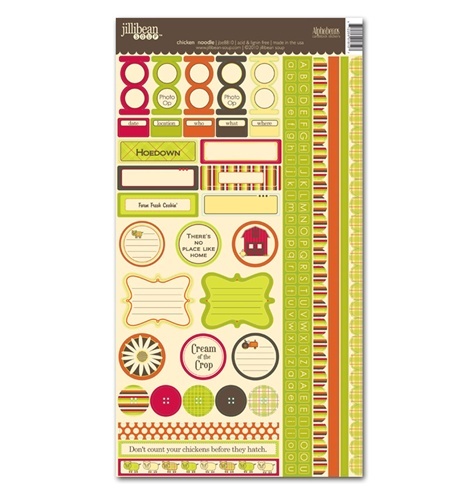 The collection includes double-sided patterned paper, acrylic stamps, ribbon and twine, cardstock stickers, letter stickers, canvas flowers, corrugated alphas, and more, all in a very agricultural-oriented green, gold, barn red, and brown -- a perfect palette for capturing springtime excursions and summer trips. -The variety of papers and colors (one of the patterned papers is a sheet music print, with the song "Old MacDonald," another is cornstalks, and a third is bold daisies, to name a few). -The fun, whimsical drawings aren't too cartoon-y, so I can use them with my older kids. -The gender-neutral palette is suitable for both boys and girls. -The high-quality embellishments (stickers that stick! Yahoo!). 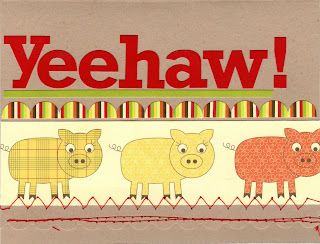 -The fun cardstock stickers that include borders, journaling spots, and "buttons"
-Some of the colors are a bit off -- in my opinion, the barnyard red doesn't really go well with the orangey-brown color, and made it hard to use some of the items together. -Some of the prints were TOO big for me to use easily (like the barnyard patterned paper -- most of it gets covered up so it's lost when I tried to use it. -The ribbon selection was small, with only one ribbon (cute pigs!) and green twine. I'd like to see a thinner, plain ribbon to use as accent. I'm a speed scrapper, so it was fun to grab a couple of theme-appropriate photos and go to town with the variety of fun patterns. 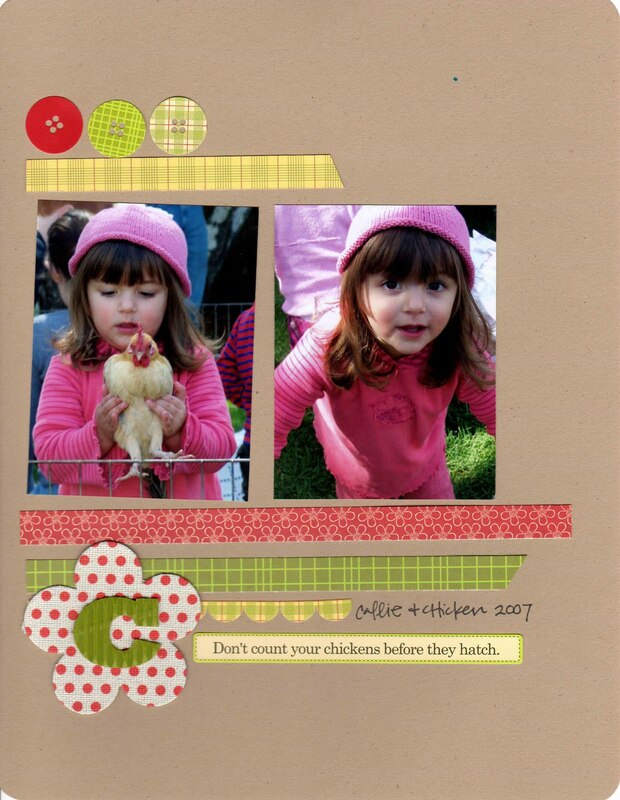 I particularly loved the very apt cardstock sticker, "Don't count your chickens before they hatch," as my little one is holding a chicken in the picture! Jillibean Soup Chicken Noodle cardstock stickers, patterned paper, letter stickers. Whenever I make a layout, I try to create a card at the same time. This assures I use my scraps AND that I have a good selection of greeting cards on hand when I need them. I guess I had pigs on the brain. I can't imagine why! I trimmed some of the pig patterned paper to size, sewed it on, and scalloped the bottom edge. Then I added a greeting, and called it good. What do you think? Does this line make you squeal like a pig with excitement? Let us know! Leave a comment by midnight EST on Thursday and you will be entered to win a prize pack from Jillibean Soup! So cute!!! Love the stickers!!! Going to have to go purchase very soon for fair pics!! I'm a huge fan of anything Jillibean!! I need to find more pics from my childhood to scrap with this line (lived on a ranch for several years.) My own kids have been pretty citified, lol. I grew up on a farm so this paper speaks to me. Will have to look for it in my LSS. Those pigs are just absolutely adorable!!! I love them. I usually love Jillibean soup because of their tight patterns. I'll have to look for this collection. Jillbean has become one of my new favorites. I love the fresh designs they come out with and their spring release was no exception. Even their embellies are cute, love love their corrugated alphas! I think everything that Jillibean has done is so cute. Great projects, Lain! Thanks for the chance to win! Looks like a very cute line. Love the pigs, they are so cute. I'd use some of the farm stuff for our recent farmer's market adventures and corn maze trip. And I love greens, reds and browns together. I love Jillibean. They are my new favorite company!! I do agree with the ribbon, though. I wish they had a few more options with the ribbon. I really like the letter stickers, but they are hard to get in my area. I like Jillibean. 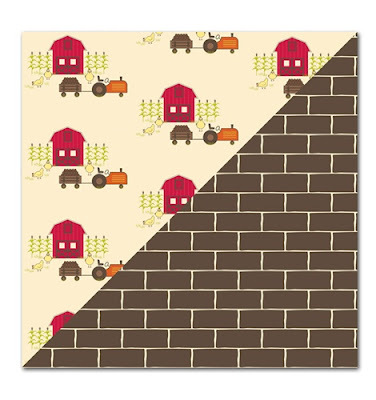 I want to get at least some of the papers in this line (not all of them would go with things that I want to scrap-the big barnyard patterns are less appealing to me). And I really like the look of some of the embellies like the canvas flowers and the corrugated alphas. I like what I see! I have boys and the color pallette here really appeals to me. I like what you made with it. FUN! I love the piggies and your card is so cute. How can you go wrong with farm themes? I'm really starting to like this company! They have some really cute stuff! I love what you did with it! I haven't seen this but it is so cute here! I would love to win! How fun! Scrapbooking for my two little boys isn't the easiest when looking for boy-friendly paper, but I love how this line can be used for either boys or girls. Man oh man, I looooove piggy paper so I would definitely love this! I own one piece of Jillibean Soup paper and have been dieing to get more so this would ROCK! Thanks for the chance to win! This line is super cute! I'm not much into farm animals, but I think it'd make some really cute cards, don'tcha think? Thanks for the review!! I love all the Jillibean Soup, ever since they first started. I think I have the best photos for that farm-likepaper. This is not something I would have chosen but after seeing the way you used this line - I think it could work. I love Jillibean Soup products. All the new lines have been on my must have list since I saw the sneaks here on TSR. We do lots of farm/animal stuff, so this line particularly speaks to me (E-I-E-I-O)~!!! Thanks for the review...your projects are awesome. Oh my goodness, I just bought this line this weekend at the LSS! NOW, I can't wait to use it! Thanks for the review! Really cute stuff! I love their papers. Very versatile! Not sure what I'd do with the pigs, but I'm sure I could think of something--they're really cute! This line is so great! I absolutely love it and can't wait to try some. Thanks for this chance!! Love the layouts and card you made!! So cute! too cute! can not wait to get my hands of some of these precious products! Great review Lain and TSR! Cute collection. Great for petting zoo, pumpkin patch, and fair layouts! Super cute stuff! Love the bricks! Ooh, I'm really diggin' those cardstock stickers! I certainly needed to see this line actually used. It kinda threw me the 1st time I saw it. But I am seeing the possibilites and I think its pretty fun. I have seen Jillibean products online but never in person. I would LOVE to win these products. Oink Oink! That's all I'm sayin'! I've been looking for farm themed products lately, and I love JS, so this is awesome! This line is sooooi cute. 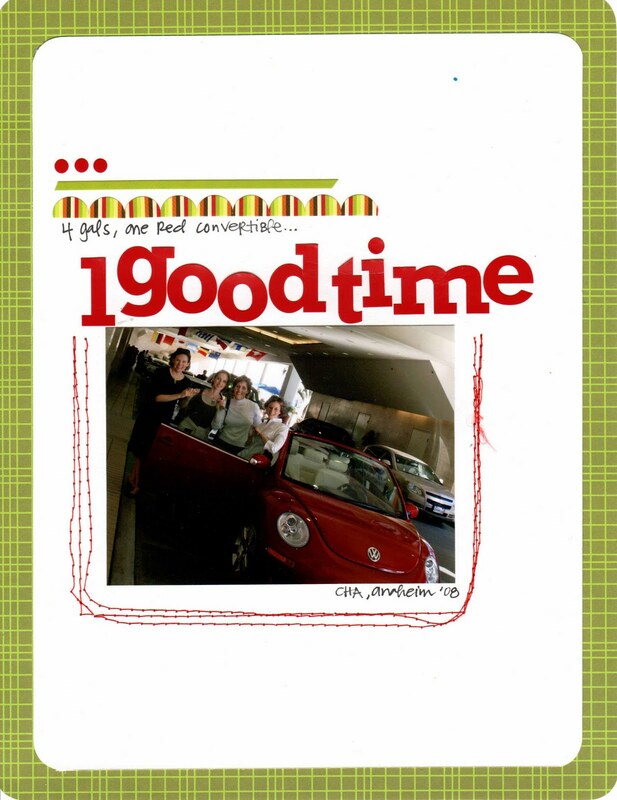 Males me happy to be a scrapbooker! I love Jillibean Soup and really love this collection It's too cute! 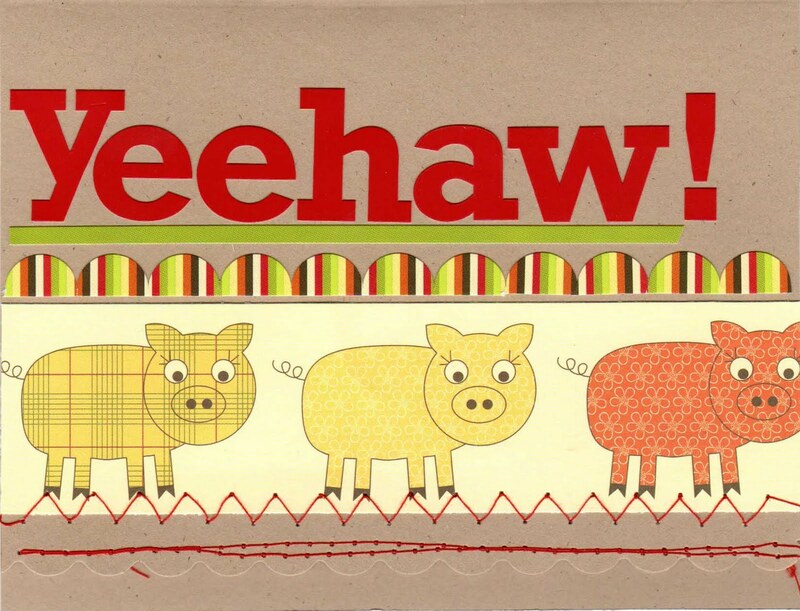 I like the whimsical farm animals and can visualize getting lots of layouts and cards done with these papers! What a great collection. I think the pigs are really cool. I really like this collection. Of course, I too am a little biased, as I pretty much adore anything Jillibean Soup! I'm not familiar with Jillibean, but the brick paper looks like it would be fun to work with. I love Jillibean papers and this new set is just beautiful. Just in time for summer and lots of farm photos with the grandkids. I'm thinking this is just a cute little line to do projects for kids! Whoa that is WAY cute!! I love Jillibean Soup even if I've never used their stuff before. I've heard wonderful things about them, and when I see them next I will BUY it!! Love Jillibean Soup! Barnyard theme is adorable can't wait to get my hands on some! Adorable!!!!! I love Jillibean Soup!! I love the simplicity of Jillibean Soup products! This is outside my normal comfort zone, which is exactly why I'd like to try it! The line is really cute. Thanks for the chance to win! This line is too cute...I can see my husbands garden pictures on it. This is really cute. I agree the barnyard paper might be hard to use but maybe the cover of a mini album? It looks fun anyway! Jillibean Soup is one of my most favorite manufacturers now! Jill's stuff is SO CUTE!!!! And Lain, I love your LO's! I too like JB Soup! Thanks for sharing your opinion on this line. Believe it or not I have yet to try Jillibean Soup. After seeing this I think I need to find some pronto. I have the perfect picture for this line. GREAT review! I feel the same way about big graphics and when the coordinating embie selections are minimal. Thanks for the info! love the layouts and the card is just too cute!! love this collection! Oh yah...I'm a big Jillibean fan as well...and i just love the country kitsch that is this line! I love the line. The colors are great. Thanks so much for the chance to win. Love the new set! Reminds me of my grandma's house! She's long gone, but it's nice to be reminded! Cute! The items you made with it are super cute! I really liked pieces of this line and didn't like some of it so much. Love the projects Lain made! Honey, I'm squeeeeealing with delight! Super cute!!! Love Jillibean! There's something really special about their stuff! Love the layouts! Gotta love any line with a touch of red in it! Count me in. I love Jillibean Soup, but my LSS does not carry much of it. The designs are unique! You didn't talk about the uber cool corrugated alphas!!!!! I love all Jillibean Soup, but I am dying to get my hands on the corrugated alphas!!! Jillibean Soup has quickly become my #1 FAV! I think Lain's layouts are SPECTACULAR! absolutely! way more than squeel! That is soo cute! Your layouts are fabulous. Love everything Jillibean! I love Jillibean Soup! Thanks for the good and not-quite-as-good points about this collection. Oh I am a HUGE Jillibean fan myself! Love it! I have just recently discovered Jillibean and like their style. Love the pig patterned paper, the journalling stickers and the stamps. wow, love to win ! Very cute line - love the pigs! I love everything Jillibean, but it is so hard to find around here, so I would certainly SQUEAL if I won!!! Jillibean papers are sooooo cute! I love jillibean soup & have already purchased the corrugated alphas and can't wait to get my hands on more! I really like the stickers, especially the mini alphas which are included on the sheet. Love your examples, they have just enough pop on them! Love the corrugated alphas and the fun barnyard pp. This line is so cute! Love it. The pigs are adorable. So cute, with the warm weather and all the fairs coming up I need some of this paper! I love the colors in this line. I would love to scrap a visit to my Granmother's farm. This is really fun and I love the colors! The papers look like a lot of fun to play with! Love the examples provided! I think it's really cute & would go great with some pictures I have of us at a petting zoo. not all of the patterns work for me...we don't do much with pigs so they are a bit much...but its a cute line. I have already used these papers for a layout of my son and my dad out on the wheat farm... it's my new favorite! This kit is so awesome. I have tons of farm and fair pics that this line would compliment. I love the colors! Awesome stuff! I love the barnyard paper and all the cute elements! Luv all these ideas! Great giveaway! Wonderful & Quirky! I have loved Jillibean for awhile now. My daughter is in FFA so this line is perfect!! Great review - Your layouts are too cute!! I have several Jillibean products and I love everything I have tried so far! This paper is so cute, love the colors. Great page. This line is so cute! I am a pig collector (in memory of my daughter) and I can think of tons of layouts with her photos. Just darling! I have only recently fallen in love with Jillibean Soup! My lss doesn't carry this line, so I would love to get my hands on it! The fact that some of the colors don't really "Go" with each other, will only make me think MORE outside the box!! I have to issue the same disclaimer about Jilly Bean ... LOVE IT ALL!!! I've loved everything Jillibean Soup has put out!! The pp is nice and thick and the buttons are to die for!! I like the colourscheme, but I'm not so fond of the motifs. Don't know what I would use it for. I'm happy though that it's something I haven't seen before so that's a big +. Wow Lain good to see you. I think the collection is cute as can be but I'm not feeling inspired by it. That could definitely be a lack of vision on my part. I love this collection! I think it would be perfect for our county fair pictures! Oh and I love piggies hehe. Thanks for the opportunity! awesome! i love this line, and absolutely love what you did with it!!! I love the colors of this collection and pretty much anything from Jillibean Soup!!! What a great giveaway! Thank you for the chance! oh, i just LOVE jillibean stuff! your samples are gorgeous! thanks for the chance! I love those colors! My favorites! ANd the stickers are awesome! I really love the pig card. I haven't used Jillibean's soup stuff yet so I am not very familiar with it but it looks like fun. I love all of it! Thanks for the review! I have so many pictures of my kids at the petting zoo! This line is perfect. Love the colors!! 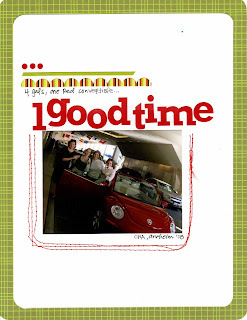 Great paper for some fun del mar fair pictures I have not been able to scrap!